Restorative dentistry is the examination, diagnoses, and management of diseases of the teeth and their supporting structures. This also includes rehabilitation of the dentition to the functional and aesthetic requirements of the individual. Restorative dentistry includes the most conventional well known dental procedures such as fillings, crowns, bridges, and partial dentures. The use of dental inlays is a restorative filling that is placed over a cavity that is forming in a tooth. Damage to a tooth through the years from natural decay can cause an inlay or an onlay to be recommended for the restoration of the tooth. Dental decay can cause the tooth to be fractured or damaged. These inlays are made from a precious metal such as gold, with modern ceramics, or with composite resins that will restore your natural smile. These inlays will be custom designed based on the fit of the fractured tooth. They will be manufactured in a lab so that they have an exact fit to your tooth. This is a conservative method of restoring a tooth, with little pain, and not much drilling is involved for the tooth. The Wand is a dental injection that is controlled by a computer for precision. An anesthetic is administered in a controlled amount and also in a slow manner so the method is considered comfortable. We call it the wand to comfort people that may have a phobia of needles. The dentistry industry came up with the name, “the Magic Wand” and the device makes dental injections as painless as possible. Sometimes the level of tooth decay for the top or bottom row of your teeth will be so severe that they need to be replaced. This problem can be remedied with a dental implant known as full or complete dentures. In other cases both rows of teeth need to be replaced. Complete dentures are recommended by your dentist when an entire row of your natural teeth need to be replaced in the upper or lower jaw. These complete dentures will replace teeth attached to a pink or gum colored plastic base. This removable gum colored plastic is removable by the base, so you can remove the dentures in the evening for cleaning. If you are experiencing tooth loss on multiple teeth or advanced and irreversible periodontal disease, then complete dentures may be the best option for you. 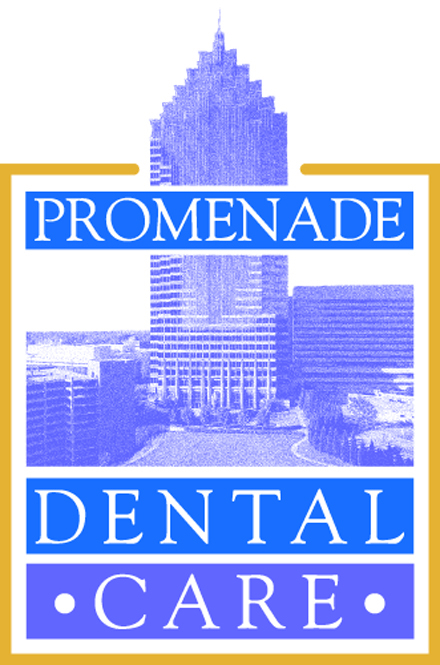 Contact Promenade Dental Care for a free consultation. Partial dentures are recommended by your dentist when a few of your natural teeth remain in the jaw. A partial denture, sometimes known as a bridge, has the replacement teeth attached to a gum colored plastic base and is connected to a metal framework that holds the denture in place. This removable plastic can be conveniently removed by the base, so you can take out the partial denture while flossing or brushing teeth. Partial dentures can be fixed or removable. This prosthetic replacement can help restore your natural smile.